British Artist Killy Kilford and Newark Major Ras Baraka launched the “Happy Signs” initiative at a press conference at St. Stanislaus Bohemian and Moravian Roman Catholic Church, on October 15. They unveiled and hang the very first of the Happy Signs and invited the Newark youth who designed the signs with Mr.Kilford. Local Newark schools, including St. Benedict’s Prep, were involved in the process of creating these signs. The other schools are Arts High, Central High School, and the Essex County Juvenile Detention Center, each with student representatives except for the detention center, who had only had a faculty representation. 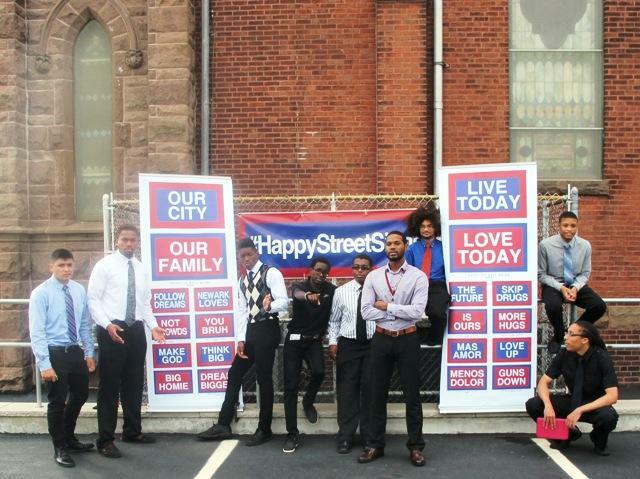 More than 50 Newark youth attended and 250 participated in the making of the Happy Signs. “Students are going to look at the signs and have pride, saying ‘I’ve had a hand in that,’” Margaret El, Vice Principal of Arts High, said. The students were dressed in their uniforms covered in stickers of the Happy Signs that read, “Live Today Love Today,” and held the original painted Happy Signs they created with Mr.Kilford in his workshops. Mr. Kilford opened the press conference, thanking all those involved and shared his story from coming to New York to the Happy Signs Initiative in Newark. He focused on the strong collaborative effort from everyone in the Newark community. Afterwards, Newark Anti-Violence Coalition Chairwoman Keesha Eure spoke about her organization, how they got involved with Mr. Kilford and how truly important the city’s youth are. Mar Baraka started his speech by applauding the students, then went on to talk about his first experience with Kilford. He ended his speech focused on the positive effects the signs will bring. “[These signs will] influence people to change their attitudes and their attitude toward Newark,” Mayor Baraka said. Although, only a few signs were put up during the actual event, 100 of them were installed that day around Newark, with the end goal of ultimately 200 signs spanning Newark’s neighborhoods later on. However, there were over 250 signs made by the students of Newark; Kilford only made 200 of them into official Happy Street Signs. Many students decided to keep their signs and the rest of the painted originals are on display by the Barat Foundation at their gallery on 85 Market Street, open to the public now. In addition to the local schools and organizations, were many reporters and news stations covering the event, including CBS, WBGO, and BBC. Many of them have their own thoughts on the event. “This is a great initiative and journalists can be cynical, but I am sure this will catch on and be key in social relationships,” Matthew Well, BBC News Correspondent, said.